Two easy-to-build components. 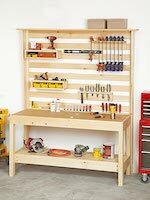 A sturdy workbench and a versatile tool-storage wall complete with custom tool racks. It will make your workspace the envy of your friends. The durable MDF benchtop provides a solid, stable worksurface, and an ingenious set of blocks behind the rails turns an ordinary one-hand clamp into a vise.